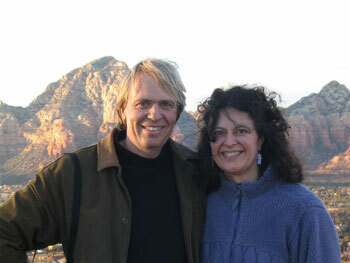 Therapy Muse is owned and operated by Garth and Sandy Whitcombe. Garth and Sandy are licensed massage therapists specializing in John Barnes Myofascial Release. They have over 22 years experience in the field of massage therapy and own the Nashville Myofascial Release Center in Nashville TN. Garth is a native New Zealander and has worked extensively with the indigenous Maori people of New Zealand, both as a musician and arts administrator. As a sound designer, musician, therapist, and composer he has developed a unique approach to the soundtrack of the healing space, fusing ancient healing sound principles with cutting edge technology. Sandy is a native Tennessean and has a background in hospital based care. She originally trained as an Xray technologist and owned a successful XRay PRN business before switching to a career in massage therapy. Having extensive experience in hands on healing and a vibrant Myofascial Release clinic in which to apply and refine new music makes Therapy Muse a unique provider of Sound Medicine music. Therapy Muse is dedicated to developing music that works as Sound Medicine. Before it is released on the website our music is evaluated in clinical settings by therapists using a range of modalities. Each Therapy Muse production is developed entirely with therapy in mind. From inspiration to final mix, the music is tested and refined to create a unique and powerful sound medicine experience.